In the fall of 1971 a number of concerned parents met regularly to begin planning for the creation of a Christian school which would serve the needs of Christian families in the greater Portland region. They were convinced that the area needed a school that viewed every subject area from the historic Christian perspective and which would work in partnership with the Christian home and church. Greater Portland Christian School opened its doors in September of 1973 with one teacher and ten students in grades one and two. The next year the school expanded, adding third grade and also kindergarten, and enrollment more than doubled to 24. 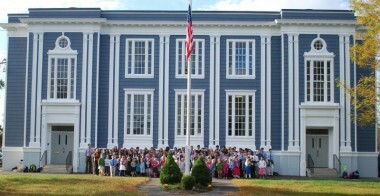 During the first three years, the school met in the education wing of the South Gorham Baptist Church. Desiring a more central location, the board negotiated to rent the Oakdale School in Portland, where GPCS stayed for three years, years during which Bea Mouton became the first principal, faculty increased to five teachers, and enrollment grew to nearly 100 students in grades K-6. The next two years were spent at Cummings School on Ocean Avenue in Portland. More grades (K-9), more teachers, and more students were added. The second principal, Gil Kitchen, had a clear vision that the Greater Portland area needed a Christian high school, and he worked toward that end. In the summer of 1981, GPCS moved to the Presumpscot School, where the enrollment increased to more than 200 students, and the school was finally able to offer all four years of high school. June of 1984 was a very special time as the first senior class, fifteen students, graduated. Later that summer, the school moved once more, this time to the Lincoln School in South Portland, its present home. After nearly 20 years of renting the facility from the city of South Portland, GPCS was able to purchase the building in 2002. More than 325 graduates, and hundreds of other students, have passed through our doors over more than four decades. We are grateful to the Lord as we see how He has honored the faith and vision of those parents many years ago. We believe that this school will continue its mission of providing a biblically based education for many years yet to come.